"Machines with intelligent control that interfaces with 3D systems are already coming into Canada, so it's only a matter of time before everybody gets their hands on it and starts to figure out how they can make their business more efficient," noted Laikram "Nars" Narsingh, Manager, Commercial Support and Development, Vögele. Vögele Vice President Jim Holland added that "We're getting more and more requests for the machines to be compatible with 3D systems to do 3D paving. Now, they might not actually implement it [right away], but . . . they're asking for that compatibility, maybe for the future." Vijay Palanisamy, Product Manager – Pavers and Feeds, Dynapac, said "3D paving technology is evolving" and their levelling system is a good example as it has become more sophisticated over time, with the ability to do 3D paving utilizing the existing jobsite plan and the profile of the road. One area of special importance for 3D paving, he added, is "for airport jobs which require very stringent smoothness requirements. Another very important area that holds strong promise for growth is thermal imaging of the asphalt from the paver. "We are starting to see some interest in thermal camera systems, thermal scanners or thermal imaging," Holland said. "Thermal imaging looks at thermal segregation and thermal streaks, and a lot of people are really focusing on that." Vögele's non-contacting RoadScan temperature measurement system provides scanning and documentation of the freshly paved asphalt‘s temperature, making it ideal for projects in which this technology is specified. The system helps road construction teams to continuously monitor the temperature of the supplied mix as placed, providing detailed data confirming mat temperature is maintained within the correct range thanks to the recorded GPS data, including precise tracking. Bomag Paving Products Manager Henry Polk has observed that "High profile jobs with thermal specifications are gaining popularity to avoid cold spots in the mat that are more difficult to compact. These jobs will typically require non-stop paving and/or reblending the asphalt at the site." He explained that this can be accomplished with something like Bomag's Cedarapids Remix Anti-Segregation System MTV/pavers, where augers inside the hopper aggressively reblend the asphalt. Another trend he has noticed is that "Contractors who face a range of projects – residential, commercial and some mainline – are opting for 10-foot pavers." When it comes to front mount and rear mount screeds, each has its own benefits. Our contributors pointed out that there is a tendency for paving operators to stay with a screed they are used to and which works best for most of their applications. In some cases, the choice comes down to what the major supplier in a region carries. However, there are some changes happening. "In central and eastern Canada, we're seeing a little bit of a trend of customers wanting to try compaction screeds, a tamper vibratory (TV) screed, not a high-compaction screed," said Holland. He explained that with a vibratory screed, you get some level of compaction but with a compaction screed, like a tamper screed which has a tamper on the front side that provides pre-compaction, you get a higher density than you would out of a regular vibratory screed. "Vibratory screeds are vibratory only, which is what's used a lot in North America," continued Holland. "Tamper vibratory, used everywhere else in the world, has a tamper bar for pre-compaction and it also has vibration. And then we have what's called a tamper pressure bar (TP) screed, which has a tamper bar up front, a pressure bar on the back edge of the screed and no vibration. TPs are really an asphalt screed. Here in North America, they are used more in specialty applications, but elsewhere in the world, they are used on thicker lifts, hot mix even, 8 or 10 inches of asphalt." Holland said that Vögele is building on the interest in compaction screeds. "We are demo'ing and running some tests with customers in Central and Eastern Canada with TV-style screeds on hot mix, thinner lifts of cold recycling type of work and also on some thinner lifts of roller-compacted concrete or cement-treated base. We're working with different customers to find them alternative solutions." While rear mounted screeds are popular, Vögele's Narsingh has observed that "Customers who are doing a large portion of commercial type work are starting to look at the front mount screeds." The advantage, he noted, is that with front narrow extensions, you can extend and retract them much more easily on applications where there are lots of obstructions, like a city street or a parking lot with many manholes, storm sewers or islands. Front mount screeds also have a short endgate, half the length of that on a rear mount screed, so that when you are dodging some of these obstructions, your handwork around it is slim to none. "The early type of front mount screeds was flimsy, so the three screed sections acted like three individual screeds," said Narsingh. "Today's newer design front mount screeds are a whole lot more rigid; the extension support makes the extension a rigid part of the main screed and the entire screed acts like one mass. "With rear mount screeds, there is the risk of trapping material between the extension and the mainframe. Also, the endgate is twice the length of that on a front mount screed. You have to manage material to be able to retract your screed when you go around obstructions . . . so it's more effort on the operator's side for applications that require a lot of in and out." On-board diagnostics are another trend, according to Palanisamy: "Operators and contractors are wanting more and more to have the paver indicate what's wrong with it when something fails so that troubleshooting becomes quick and easy." Walt Dudnick, Dynapac Sales Manager Western Canada, has seen that "Mobile feeders (material transfer vehicles) are becoming more popular and I have seen more discussion on their benefits." However, he notes that for most paving contractors, the expense is a deterrent to using them. Smoothness is another trend, said Jon Anderson, Global Sales Consultant, Caterpillar Paving Products. "There appears to be more implementation and focus on International Roughness Index (IRI) smoothness specifications across the provinces. This could be attributed to rising maintenance costs due to greater traffic volumes and greater axle loads placing more stress on pavements. There is a proven correlation between smoothness and lower maintenance costs, which leads to longevity of the structure. IRI is one method that can be employed to indicate smoothness during the laydown process." Seemingly small mistakes by the operator can have an enormous impact on mat quality. This is the reason that so many of the new features on pavers and compactors developed over the past decade are designed to assist the operators and help automate paver functions, explained Bill Laing, Product Manager – Road Equipment, Volvo Construction Equipment. "Speed limiters, grade and slope control, auto vibration and material-flow sensors on the screed are all perfect examples of technologies that help automate tasks that could cause mat quality problems, and really help to make paver functions easier for the operator," Laing said. A good example of such a technology, he added, is Volvo's standard four-sonic feeder system, where each sensor constantly adjusts the augers and the conveyor speed to deliver perfect head-of-material control at all times. For Vögele, its Niveltronic Plus system provides automated grade and slope control, a unique levelling system which paves true to line and level on any kind of base. Vögele's integrated system for 3D control of road pavers utilizes plan data – or data from the project's earthworks – and combines them with a GPS or laser positioning system to navigate the paver along the planned route. Vögele's 3D system extends the Niveltronic Plus levelling system into the third dimension, allowing automatic control not only of grade and slope, but also paving width and direction of motion according to a route's digital design data. According to Vögele's Narsingh, a major driver of these advancements is intelligent machine control, which itself was driven by the development of the Tier 3 engine to meet government-mandated emissions regulations for diesel engines. Tier 3 engines, he explained, required a computer to control the engine fuel and emissions, and this led manufacturers to ask themselves what else they could do with a computer on board. He mentioned that one of the things which smart machine control provides is better steering capability to hold a straight line. "If you can't hold a straight line, then you can't do a proper joint. Today's machine control makes it a whole lot easier for operators to hold a straight line. Also, it makes it a whole lot easier for operators to manage their head of material using digital displays that show the operator how much material is in front of the screed. With intelligent machine control, every time the paver stops, the screed goes to a hydraulic lock. [Material] does not settle or give you a hump when you take off, so it allows you to maximize your smoothness." Palanisamy said "Highway-class pavers continue to evolve in terms of technology that assists the operators to do more and to achieve better mat quality. Specifically, in the area of operator controls, there are a lot of efforts by many manufacturers to make the paving process easier and efficient. Dynapac refers to them as operator assist functions, [which] include Clean Assist, Fill Assist, Steering Assist, Set Assist and Truck Assist." Clean Assist allows one operator to clean the auger and conveyor area by running them in slower speeds; Fill Assist lets the paver operator fill both the conveyor and auger areas to an optimal level with one switch as the paving process starts; wheeled pavers can turn in tighter areas with the use of Steering Assist; and with Set Assist on the Dynapac SD paver series, the paver stores the current settings (including material flow rate, paving width and thickness) and after it is moved to a new jobsite or across a bridge, for example, the operator can recall the previously stored settings at the push of a button. Dynapac's latest innovation on the SD paver series is Truck Assist, which informs the truck driver, by a series of LED light bars mounted on the hopper, when to lift the truck bed to unload asphalt, when to approach the paver and when to stop loading. This is helpful while night paving or where horn noise is a problem. To prevent mat quality issues caused by a truck bumping into the paver, Dynapac uses a Safe Impact push roller that absorbs the shock. Caterpillar's Anderson pointed out the importance of "Integrated grade control systems [which] provide a significant benefit over pin-on systems as they enable greater automation and control." The benefits, he said, are "more flexibility, more information, [and] faster and more precise control [which] enables greater efficiency and high-quality results. A pin-on grade control system is designed to provide a minimum standard of performance for many different pavers. Cat Grade Control is optimized for use on the Cat paver. "He explained that integration means it is built-in, providing protection for the components and eliminating the need to set up in the morning and stow at shut down. "Calibration is much simpler and faster than with pin-on systems and there is better control with greater precision. Sensors can be switched without need to null, calibrate or take out of auto. The integrated system can also access more machine systems directly than a pin-on system can; thus, the operator is aware of the machine performance while running grade control. Because the system is integrated, information or control can be accessed from either side of the screed, or up at the operator's console." Bomag's Polk noted that segregation and other pavement imperfections are a big problem being addressed by manufacturers. One way to deal with segregation, he said, is with an outboard spreading-auger drive which eliminates the centreline gearbox drive for screed sections. "If the screed is not properly configured with deflector chutes, chain skirt boards, reversing augers and 45-degree baffle plates to prevent mix from rolling under the gearbox, unconfined material can cascade under it, so density suffers and centreline segregation/top-down cracking can occur. With outboard auger drive, the screed sections back up to each other, so there is no density loss at the centre." Another solution he mentioned is found on Bomag's Remix Anti-Segregation System pavers "which have in-hopper auger sets that uniformly draw down materials from all hopper areas and aggressively reblend 100 percent of the asphalt prior to it being transferred to the screed. This delivers uniformity of material and temperatures, critical when working on thermal specification projects. Uniform mat temperatures also help the roller to achieve spec densities." Palanisamy said that material segregation is a problem with different asphalt mixes and Dynapac is at the forefront of minimizing or eliminating this issue when the material goes through the paver feed system. "By using the thinnest (six-inch wide) centre chain auger box, combined with reverse auger flights, the centreline segregation is minimized to a greater extent." Dynapac has an outboard drive auger option for their 10-foot highway class pavers, which Palanisamy said "completely eliminates the centreline segregation." Also, he noted that by utilizing larger 17-inch-diameter auger flights, the augers spin more slowly and material is not segregated. Dynapac uses an innovative four auger system on their commercial class pavers so that the augers, mounted on the screed, extend or retract with the screed extensions, Palanisamy said. This allows the contractor to pave the full width of the screed extension without adding any additional auger extensions. Keeping equipment operating is essential when paving. "Unexpected paver downtime is extremely expensive, as it stops the paving train," said Polk. To help address this serious issue, Bomag wants to show paving contractors and governments the benefits of using telematics by providing them with three years of free telematics on all Cedarapids Tier 4 Final pavers. "This gives key personnel, like service managers, alerts and advance warning of potential service issues or upcoming planned maintenance." Anderson noted that "Cat pavers feature onboard diagnostics that can provide actual descriptions rather than just a fault code, helping operators to immediately understand the condition. This allows the crew to act on information immediately if the need is there." Vögele uses backup systems in the diagnostics, Narsingh said, which means that if there is a sensor or cable failure – typical during a day of paving – it can override these sensors and still maintain consistency of the head of material. To make troubleshooting quick and easy when something fails, Dynapac's on-board diagnostics are done via a CAN (Controller Area Network) bus control system that allows for a greater level of diagnostic information, including paver- and engine-related error codes, explained Palanisamy. Telematics make it possible to provide remote troubleshooting and allow OEMs or dealers to go to jobsites with pre-informed details about the problem to fix the issue, which minimizes downtime. He also added that maintaining screed heat is critical and that Dynapac has addressed this with a fail-safe heat management system on the VF0816C screed for the FC1600C paver which allows the screed to heat uniformly even when there is a loss of a heating sensor in one of the screed sections. Good paving also depends on a good crew and there are ways to help them perform at their best. "A focused crew is a more productive and safer crew," said Anderson at Caterpillar, "so greater consideration is being given to the crew working environment." Some examples he gave are a top-deck cooling package that provides cool and quiet operation, improved work environment and communication for the crew, and fume extraction systems which provide a more pleasant working environment. Bomag: A primary consideration for the contractor is the expected primary applications for the paver, not only short-term but also for several years, in order to match the right paver to the job and income stream. For contractors entering the market or paving mainly residential and commercial projects, an 8-foot commercial paver may be the best choice. Contractors paving a mix of residential, commercial, highway and mainline projects should consider jumping up to a compact 10-foot paver. 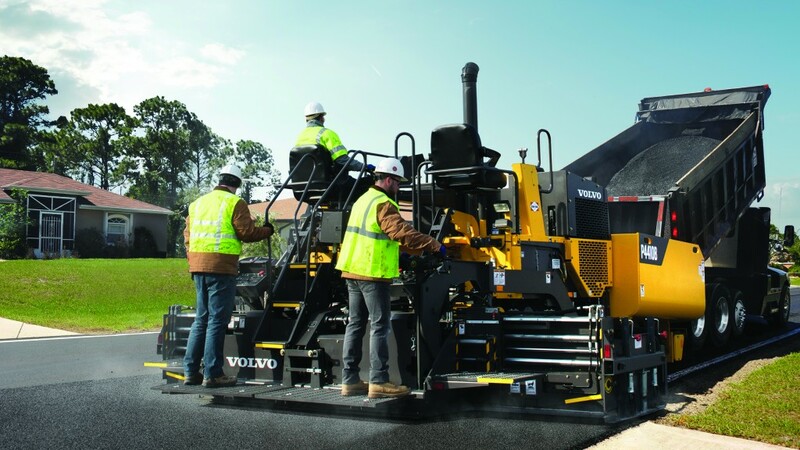 Those contractors paving primarily highway, mainline and heavy commercial/industrial jobs should consider a 10-foot mainline paver offering high hopper and production capacities. Remix pavers offer asphalt reblending capabilities for jobs with tough thermal specifications or for contractors experiencing centreline segregation issues resulting from the centre gearbox drive. If your primary market area demands frequent hill/mountain paving, consider purchasing a track paver, or a wheel paver with an oversize drive tire, that will offer the extra traction required for pushing trucks up inclines. Caterpillar: Total cost of ownership should be considered when purchasing a machine. This includes not just the purchase price, but also owning and operating costs as well as resale value. You might want to consider what kind of undercarriage would be most suitable for the type of applications that represent your largest opportunity. Track pavers have more flotation and traction, and are more stable pulling wide widths; wheeled pavers provide greater mobility and maneuverability for urban and residential paving, as well as for some small, commercial paving jobs. Another consideration is the type of haul truck most often used. A track paver can push heavier trucks on most surfaces than a wheeled paver, and generally have much better traction on steeper grades, especially when pushing loaded trucks. Dynapac: Buyers should consider asphalt paver reliability and performance, and look for a machine that is user friendly. Keep in mind the end-user relationship with the paver dealer and how close they are for service and parts. Vögele: Number one, look at your applications. If there's a large percentage of jobs that require a lot of in and out, front mount screeds are probably something they should look at. Look at pavers that are capable of interfacing with 3D controls; that's the future. Another thing to consider is integrated automatic grade and slope control systems that tie in with the 3D. An operator doesn't have to bring a suitcase with a bunch of components and have to install it on the paver to run the grade and slope, it's built into the paver control. They should also consider pavers that are capable of interfacing with a paver mounted thermal camera. An onboard diagnostic system can help contractors manage their business more effectively. Buyers may also want to consider the engine. To date, Cummins Tier 4 Final technology does not use a particulate filter, so fuel consumption is a whole lot better with that type of technology. Volvo: First, a customer wants to know that their purchase is reliable and available for work when needed. When their paver does have a hiccup, they need to feel confident that their dealer and equipment OEM will have their back to ensure the machine can be returned to work promptly through high quality parts availability and knowledgeable service. Second, a customer is looking for the paver to deliver a consistent, high quality mat under a variety of applications. A high-performance mat can only come from a high-performance screed. So, with that, a customer should look for a paver with screed options that meet their application needs consistently. Customers demand ease of use and repeatability in their screed operations. Bonuses can be lucrative, and penalties harsh. Paving customers expect the former and not the latter.